Legislation largely determines how companies operate. 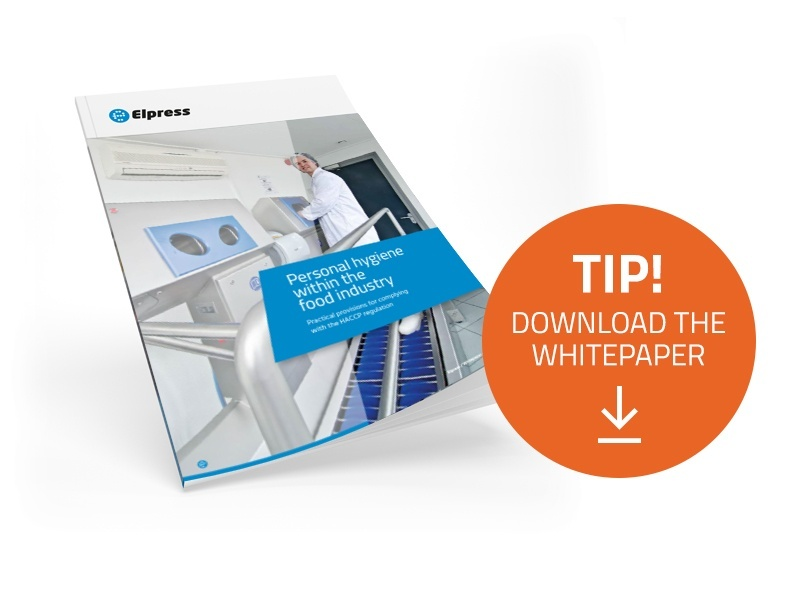 In the food industry in particular, clear rules are prescribed by national and European governments. This is not surprising, given the industry’s importance for citizens and the economy. The industry takes its obligations into account in its vision, which acts as the basis for its policies. Developing policies requires smart solutions; solutions that work. Elpress provides applications that give a company with the tools it needs to comply with HACCP regulations, for example in the area of personal hygiene. Equipment, conveyor belts, storage systems and cooling obviously have to be hygienically clean and kept that way. But people work where food is prepared or made. Personal hygiene is highly relevant to keeping a company’s standards high. Monitoring this hygiene goes further than just washing your hands after lunch or after visiting the toilet. It requires constructive measures that oblige staff to always enter the shop floor properly cleaned. 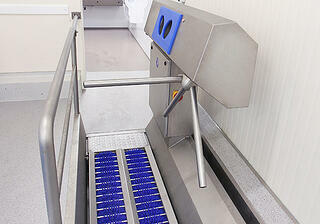 Elpress has known how to ensure a hygienic situation for 40 years. In the five applications below, you will find practical partners for ensuring the HACCP plan for personal hygiene. A hygiene lock is a construction that you have to walk through before you get to the shop floor. The lock involves several steps to do with cleaning and disinfecting hands, shoes and possibly clothing. Hygiene locks can have an open or forced setup. In the second variant, the passage is blocked with gates. The door opens only when a certain operation, such as disinfecting the hands, has been carried out. Footwear carries visible and invisible dirt. Thorough cleaning is therefore necessary. There are various arrangements that take care of soles and edges, soles and shafts, or just the soles. A disinfectant can also be used to remove invisible microorganisms. 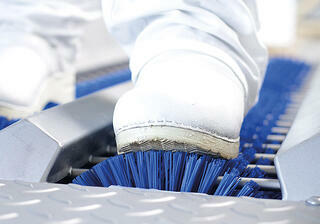 Sole cleaning can be a stand-alone operation or part of a hygiene lock. Foods come into contact with hands. After lunch, a visit to the toilet or a smoking break, the hands must be washed, dried and disinfected. 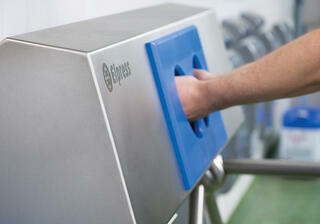 Hand cleaning is essential either as part of a hygiene lock or as a stand-alone unit. The chemical dispensers are there for thorough cleaning of the hands. It is not possible to enter the shop floor without carrying out the relevant action. A turnstile, a type of gate, blocks access and is opened only after the operation has been carried out. A sensor registers the action and sends a signal to the turnstile. This unit is used for cleaning aprons manually. 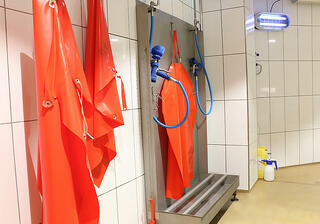 A brush with water supply and a spray gun can easily be used to clean the aprons, which can be hung up. The water is discharged directly through a built-in gutter. There is a bottom grille in the gutter, which is also suitable for placing boots on for manual cleaning. Want to know more about personal hygiene and the possibilities? Would you like to know more about the above applications? We have bundled everything together for you in a handy white paper on personal hygiene. You can download this free of charge from our website.